Order a Korovai for your wedding, anniversary, or other special occasion. ​Shipping is available through UPS anywhere in the US, Canada and the World. 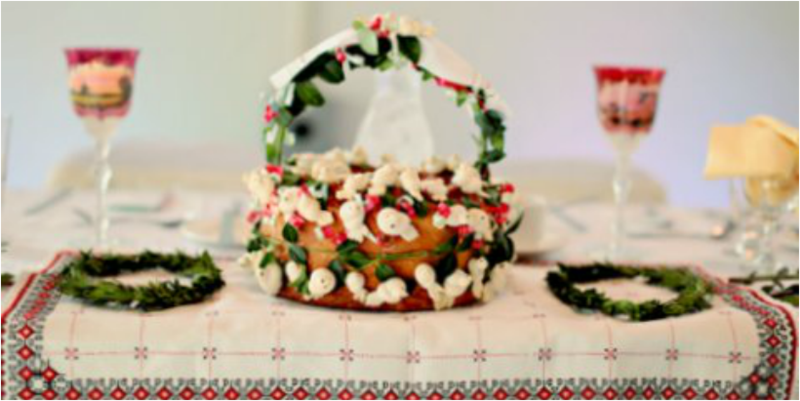 The Korovai is a traditional Ukrainian celebration bread used at weddings, anniversaries and other special events to symbolize family and community. The Korovai is adorned with ornaments of baked dough: two birds in the center represent the couple, other birds represent family and friends and dough swirls, leaves and pine cones give the blessings of earth's bounty. The entire arrangement is surrounded by a wreath of live myrtle, a symbol of love and purity. It can be used as a greeting bread, partnered with the wedding cake and shared with the guests as a symbol of good luck and future prosperity. Numerous standard options and special orders are available. Please click the links below to see everything! Be sure to like and follow my Korovai social media pages. I appreciate your referrals!